Stupid Sandy is still messing with me! I was sent a gorgeous indie polish from Imperial Nail Lacquer to review and it was delivered late to me, without power. I am finally able to post this beauty! Get ready for an extra Halloween celebration in November because it is time to do the Monster Mash! But it is so much more! Check out this surprise twist! What a brilliant glow. 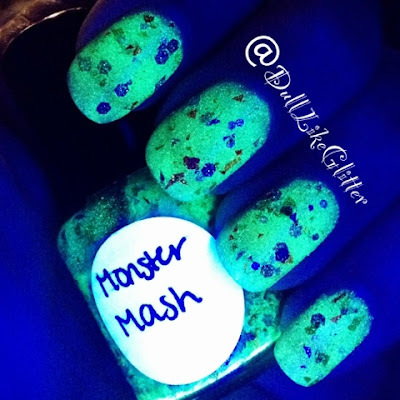 This polish is full of glow in the dark pigment! The glowing base is translucent so you can layer it over other colors and still get a glow in the dark effect. 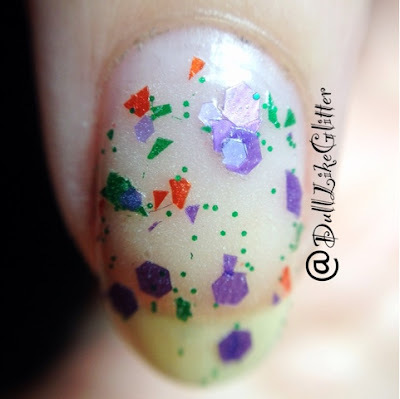 This polish is amazing on its own or would look great layered over any Halloween colors to celebrate or over a white to give the glitters some pop. Glowing doesn't just have to be for Halloween either! Glowing polish is great for going to parties where you know black lights will be there or concerts. It will be that little extra detail that will really set you apart. As always Imperial Nail Lacquer has a gorgeous formula and fantastic glitters that spread evenly and lay flat. It is everything I could ask a glitter to be, plus it glows in the dark! This polish was sent for review and is based on my individual, honest opinion! Please note that glow in the dark pictures were taken using a black light to accurately portray the glow in the dark effect.